The first step in Dr. Andrew Weil’s program, “8 Weeks to Optimum Health” is to purchase a bouquet of cut flowers. In the 6 or so years since I did the program, I have slipped up on some of his other recommendations. One thing I still do is buy myself cut flowers every time I go to Costco. 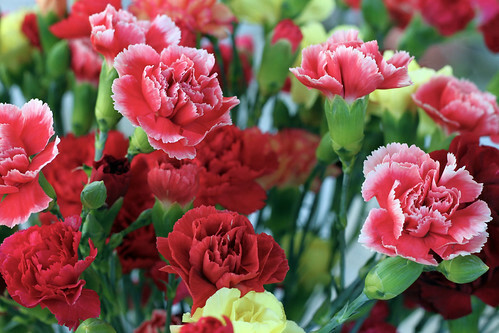 I love getting the carnations since they last for such a long time. I think these are really pretty. This entry was posted on Friday, October 2nd, 2009 at 3:00 am and is filed under Life. Tagged: Life. You can feed this entry. You can leave a response, or trackback from your own site.